MV Hallelujah first set sail in 2002 under the name of ‘Viking of the Orient’. 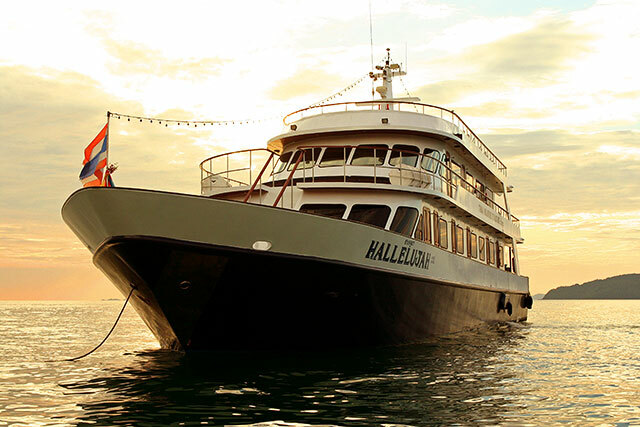 She has now been completely overhauled and began cruising under the new title of Hallelujah in November 2011. 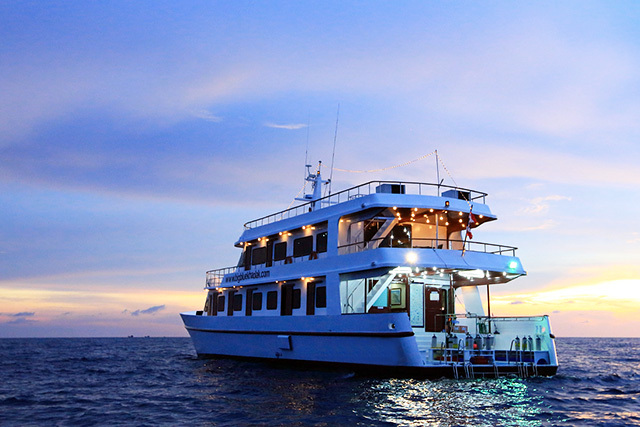 Being a large roomy vessel boat – some thirty five metres long in fact she offers up lots of space, including a large indoor air-conditioned saloon also with a big sun deck. 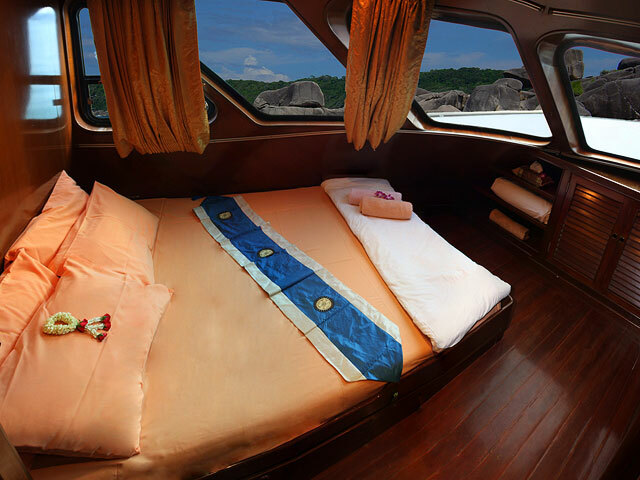 A luxurious single cabin on the upper deck. 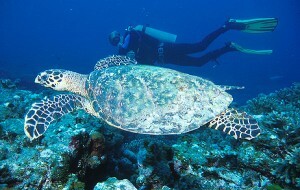 15 % Discount available For non diving guests /snorkelers. 12L Tanks, weights & belt, DIN Adaper. All meals and snacks, fruit, coffee, tea, soft drinks, water. Transfers to/from hotels in Phuket & Khao Lak. Hallelujah can take up to twenty five twenty five guests in total. 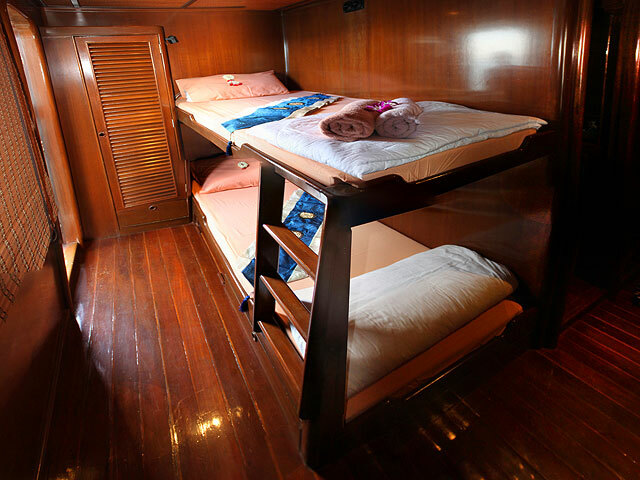 The foremost deck has a total of ten Standard twin cabins with two large double bed cabins at the front of the ship. All the cabins have big windows, with doors to the glorious views outside, bathrooms and air-conditioned come as standard. 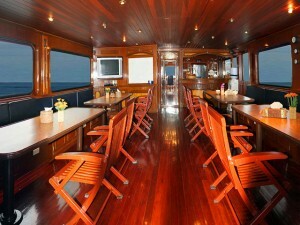 There is also a VIP single cabin up on the top deck. All the cabins have Air-conditioning, Toilet and shower with hand basin, towels and toiletries, Sea-view windows, Reading lights, Cabinet and mirror, Bedding, 3 pin mains outlet 220 Volts AC, Life jackets, Space for luggage. MV Hallelujah is armed with four Life Rafts, and a full accompaniment of life jackets, medical first aid equipment, also an Oxygen supply with a six thousand litre capacity. Closed circuit video on the dive deck and in the engine room making sure the captain has his eye on everything. The food on Hallelujah is outstanding there are three main meals served buffet style on the comfy shaded area. Our onboard chef prepares both Thai and international cuisine fresh every day and snacks are always throughout the day. If you have any special dietary requirements they will be catered, do please inform us at time of booking. 17:00 Pick up time from all areas. 19:30 Arrive at Tab-Lamu Pier (Phang-Nga Province). 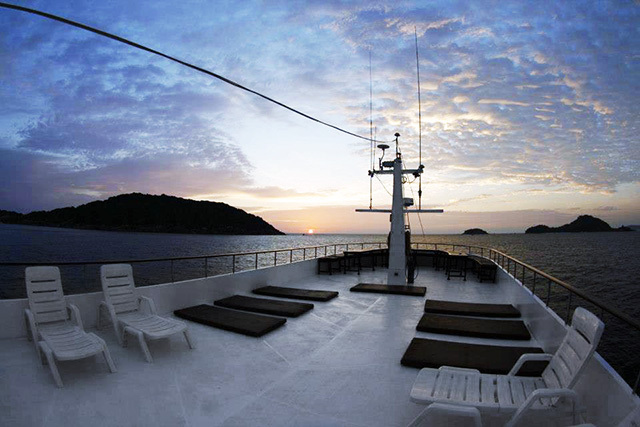 20:30 Welcome dinner onboard M/V Hallelujah – set off for the Similan Islands. 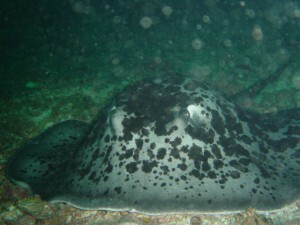 Day Two – First Day Diving at Similan Island – 3 Day dives + 1 Sunset dive. 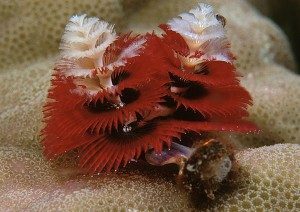 Day Three – Second Day Diving at Similan – 3 Day dives + 1 Night dive. This is sample itinerary which may be altered at short notice due to safety and weather conditions. 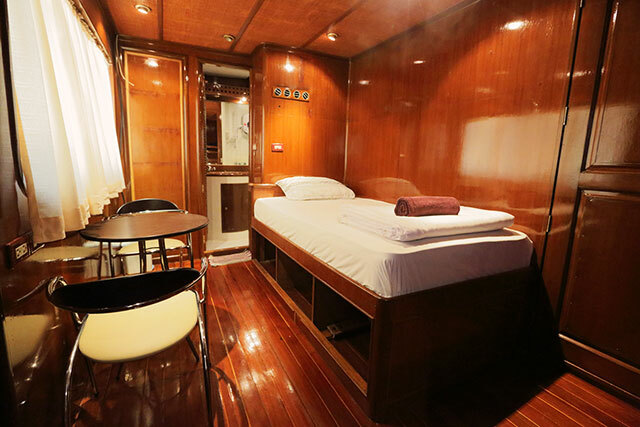 M/V Hallelujah is a thirty five metre long steel-hull boat accommodating twenty four divers all in fully air conditioned twin or double bed cabins fitted with en-suite facilities. Also we have large saloon and a comfortable dive deck and roomy sundeck to enjoy. Fresh Water Capacity: 25,000 Liters. Safety: 4 x Life Rafts, life jackets, medic first aid station, 6,000 liters Oxygen supply, closed circuit video on the dive station and in the engine room, and fire extinguishers.